Restaurant Revolution Technologies partners with restaurants all over the country to assist them with every aspect of their off-premise business, including takeout, catering, and delivery services. This frees up workers inside the restaurant to focus on diners, which improves overall customer satisfaction and helps each restaurant run much more smoothly. Restaurant Revolution Technology's off-site ordering approach takes each order all the way to the point of sale, which means there's no reason to re-tabulate when the customer receives the food. The process is seamless and increases efficiency while also reducing billing mistakes. Additionally, information about each order is kept in a database for analysis, which helps restaurant owners track behavior, so they can make better business decisions. One of Restaurant Revolution Technologies main features is a virtual call center staffed by remote workers who handle takeout and delivery orders. They've been hiring a lot of people lately, and we've heard some interesting things about them, so we decided to have a closer look at the job and see what's up. As a virtual server, you'll be taking orders for a wide variety of different restaurants while simultaneously serving as a brand ambassador, delivering a specific type of customer experience to match the clientele and style of each restaurant. This means you'll need to have an intimate knowledge of the menus for several different restaurants. You need to know what's on sale at any given time, how and when to upsell customers, how to answer questions about various menu items, and all sorts of other little details. Keeping all this in your head at once for several different restaurant chains could potentially be pretty challenging, so it sounds like you'll need to be fast on your feet to really excel at this job. They start you at $9/hr and after 90 days they'll raise you to $10/hr. There's nothing on the company's site about when and how the pay is delivered, but I found a few workers in other places on the net who said they get paid every week. They're flexible to an extent when it comes to setting your schedule, but you need to put in a minimum of 20 hours a week, and you'll have to be willing to work different hours than the usual. Restaurants do their biggest business after 5 p.m. and on weekends, so a good portion of your scheduled time will have to be during those hours. According to my research there is usually quite a bit of work available so if you want to put in a full 40 hours, it should be easy to do so. There aren't too many requirements for this position compared to many other call center jobs out there, so this could be a good beginner gig if you want to start doing phone work. There are no experience or educational minimums at all. They're just looking for people with solid verbal and written English skills, along with a quiet place to work. You also need to live in one of the states where they're currently hiring. That list is changing as the company continues to expand, so if your state isn't currently included, check back later. As of the date of this blog post, the states list includes – Delaware, Florida, Idaho, Iowa, Kansas, Kentucky, Louisiana, Missouri, North Carolina, Ohio, South Carolina, Tennessee, Texas, Pennsylvania, Virginia, West Virginia, and Wisconsin. You need a decent computer and a good internet connection. To apply, you just go to their site and submit a resume. There isn't a lot of information available about the interview policy. I found one person who said their interview was conducted via email, and two more who said the interview was over Skype. The company has developed a bit of a reputation for hiring people pretty fast, so you may not have to wait very long to get started working if you make the cut. 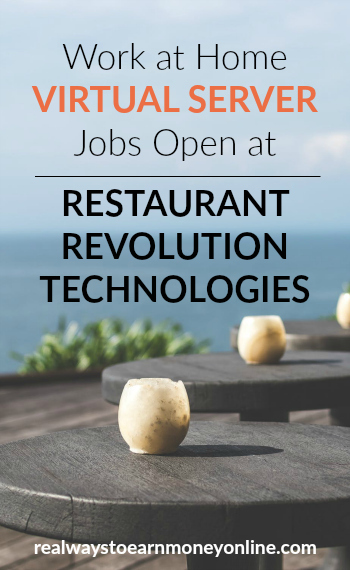 I used Glassdoor to see what former and current employs had to say about Restaurant Revolution Technologies. What I found was a pretty extreme mix of absolutely glowing praise and really harsh criticism. The people who enjoyed working for the company seemed to appreciate the flexibility of the job and the consistently available work. Those who were dissatisfied had lots of complaints about the management. According to these people, it seems like many of the managers are pretty hard to deal with. There were several comments about rude behavior, and unfair personal criticism. Overall the positive and negative reviews were divided pretty evenly, and since the company is fairly new, there aren't that many reviews out there yet, so it's hard to say which side is more correct. It's possible that there are just a handful of bad managers generating most of the negative reviews, while the rest might be perfectly competent. Also, the company is still growing rapidly, so the management strategies could still be evolving. Things might change drastically for the better in a short period of time. With only a handful of reviews to go on, it's tough to make any sweeping generalizations about the quality of this company or their management practices. I wouldn't blame anyone for giving this opportunity a pass based on some of the negative comments. But, on the other hand, it sounds like it would be pretty easy to get hired with these guys, and you can seemingly get plenty of hours of reliable work. It might be worth the risk to just take the plunge and see how things go. If you think this sounds like an interesting opportunity, go here to read more and put in your application. Looking For More Work at Home Jobs And Information? If so, I recommend my e-book with a list of 150 remote companies that are usually hiring along with step-by-step instructions for finding work at home job leads on your own. This book is basically a download of the work from home information inside my brain that I've accumulated over almost 10 years of online research and maintaining a popular work at home blog.